This paper provides a critical review of literature on management controls and their context. The review indicates that more emphasis has been placed on organizational than environmental factors and that the effectiveness of different controls in different contexts remains practically unaddressed. In general, research has been ad hoc and focused on results-oriented financial controls, short-term efficiency, and individual level of analysis. Even for commonly studied topics (e.g., budget controls), evidence has often been inconsistent and limited to manufacturing organizations, with little integration and refinement of previous theoretical models based on new evidence. Further research is required to investigate the relative importance of different financial and nonfinancial controls in different types of organizations in order to develop more comprehensive performance measurement and management frameworks. Pollanen, R. (2007). 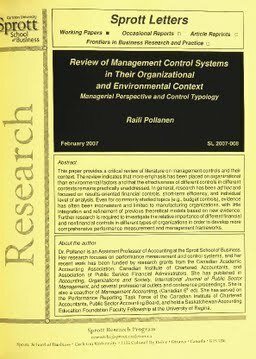 Review of Management Control Systems in Their Organizational and Environmental Context : Managerial Perspective and Control Typology. Sprott Letters, February(2007).